Make sure you’re getting the most from your home’s Wi-Fi connection! If your home is like many in our area, you have high-speed internet from Yucca Telecom. Yucca brings the internet to your home, and from there a router sends a Wi-Fi signal that can connect all wireless devices to the internet today and in the future. To make sure you receive the best Wi-Fi signal, you need a Wi-Fi network that will work well in every room of your home. • It’s easy: our technicians determine what your home needs to provide the best Wi-Fi network. • Very convenient: we supply the equipment—you don’t have to purchase anything from a store. • No hassle: we’ll do the work of making sure your wireless devices connect to your Wi-Fi network. network extends all over your home. 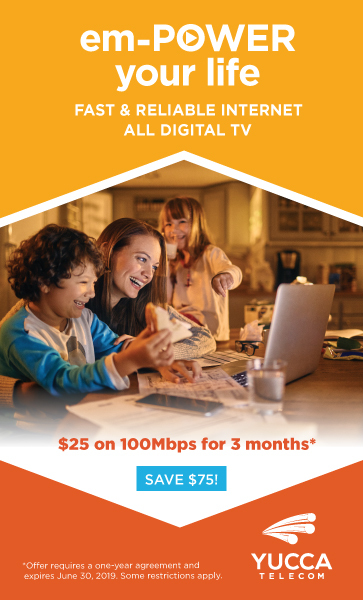 • It’s affordable – just $9.95/month! Get it all connected – call us today at 575-226-2255.